GINOWAN HARBOR, Japan (9/7/2009) -- Kai Johnston lowers the U.S. flag on Scarlette at Ginowan Harbor at the end of Labor Day. We hung out around the boat and harbor today, just spending some father and son time. Cap'n J (right), Tanaka and Kelly Dolan cruised off the west coast of Okinawa Aug. 30, 2009. GINOWAN HARBOR, Japan (8/30/2009) A crew of three left this typhoon protected harbor early Sunday morning for a three-hour sail off the west coast of Okinawa. 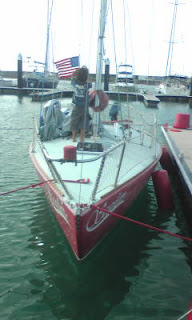 The sail was uneventful but it was the first time two of the crew had been aboard Scarlette, a 1985 J/24 sailboat. 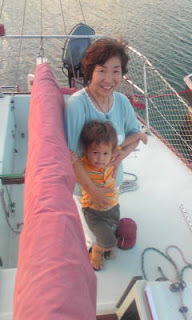 Tanaka, a neighbor of mine from mainland Japan, takes the tiller during his first sail ever! Whoo hoo! Tanaka doesn't speak English but Cap'n J's pigeon Japanese got him through. The look forward. 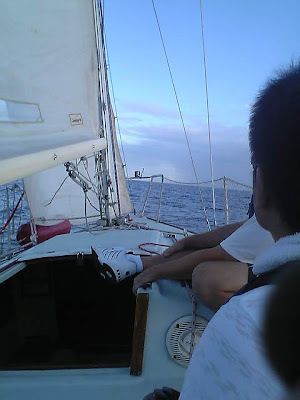 We were actually following another sailboat as we cruised past the Chatan. 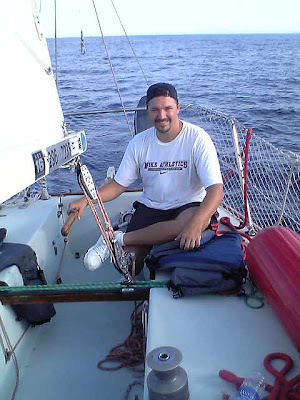 Kelly Dolan -- a coworker of mine who just arrived on island from mainland (he was at Yokota) -- takes the helm with a full relax smile aboard Scarlette. 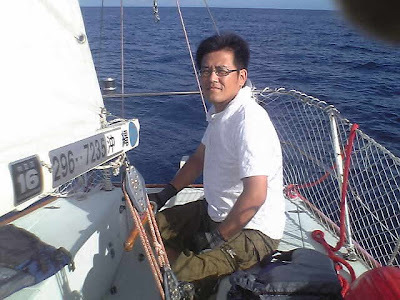 Tanaka at the helm with the South China Sea horizon on his back as we headed for home.